The 5x1 4K60 Presentation Switcher supports 5 inputs including 3 HDMI ports, 1 VGA (YPbPr/CVBS) and 1 DisplayPort, scaling to HDMI and HDBaseT outputs (Mirrored). It offers flexibility application of audio which includes unbalance audio, MIC In and line out. The audio processor offers auto-mixer and auto-gain control to mix or reduce background audio in order to enhance major audio source. 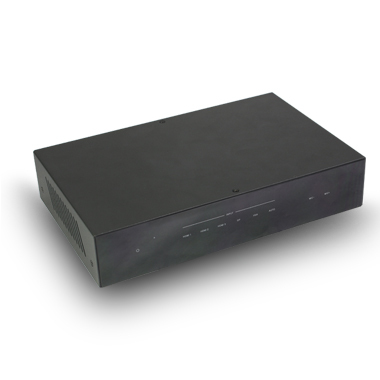 The system could be controlled and configured easily via Telnet, Web GUI, IR remote and RS-232. This switcher is a suitable solution for presentation purpose at classroom and conference room.